Vester Square is a proposed redevelopment at the Search Optics campus, located near the corner of Vester and Burdette streets. 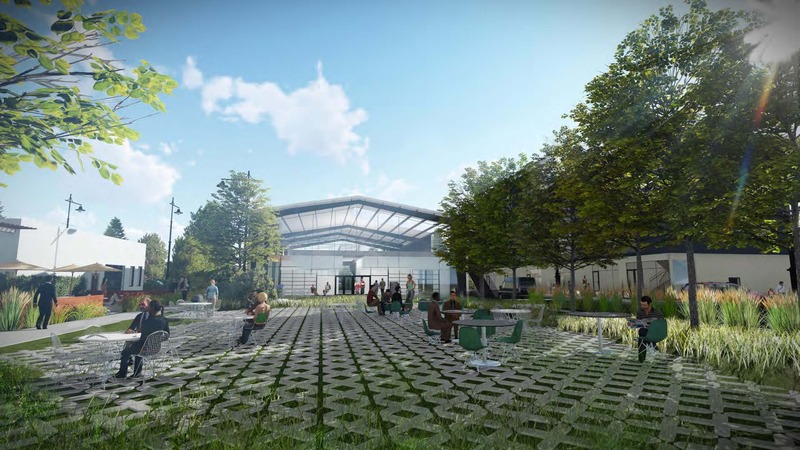 The project proposes to integrate existing developments, such as Search Optics main office, Incubizo, and Voyager restaurant, along with new public space, office, retail, restaurant, gallery/event, and residential development uses in a unifying plan. Proposed new public spaces include a public plaza/square at the entry to the development and potential pocket park in a portion of Burdette right-of-way. New proposed structures include a two-story, 10,000 square foot shed-style building adjacent to the square and a five-story mixed use structure with an estimated 15 upper level residential units. An existing building, 621 Vester, is proposed to be adaptively reused with a potential brewery use and accompanying outdoor seating area. Sustainability elements such as rooftop solar and bioswales and the conversion of impervious surfaces to open spaces are some of the proposed modifications to the site. The project is seeking direction from the Planning Commission in the form of a preliminary planned unit development (PUD) discussion. The upcoming meeting is a discussion intended to inform the commission and community of the intended project and get an understanding of plan changes prior to a formal plan submission. How can I review the documents and plans submit for the project? The project is in discussion phase and will be available on the Friday prior to the meeting at this link. Staff is available to discuss the project at available at City Hall during business hours, Monday-Thursday 8am-5:30pm.